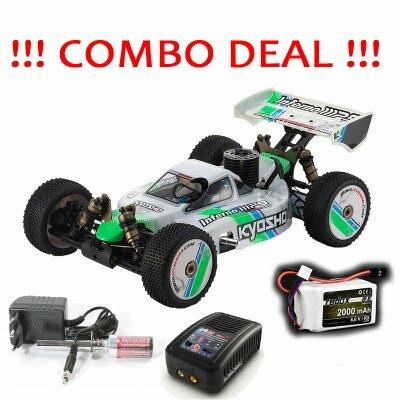 Цена в точки: 23650 т.
COMBO DEAL -1/ 8 Racing Buggy - Kyosho Inferno MP9 TKI Readyset + Glow Starter + Battery and Charger. The TK13 is the most advanced version of the 1/8 INFERNO racing buggy. Performance that delivered an unrivalled record of 8 World Championship victories is now at your fingertips with this great value Readyset package that challenges the rule that high-end models can only be for expert-level drivers. Professionally pre-assembled, even the engine is installed and fitted with a recoil starter so a separate engine starter is not required. The pre-installed 2.4GHz R/C system includes an LCD screen that allows precision setting adjustments to be easily managed. This machine is ready to race and win straight out of the box at a great value price. Until now, the performance and reliability of advanced high-end models were suitable as introductory models, but the price was always too high. Now we can recommend this model to beginners for the best possible start to model racing. How was the cost reduced? Machine cutting was replaced with punching in the manufacturing process, which delivers the same strength and function but at a much lower cost. More than 60% of components are manufactured in Japan to maintain the high quality standard. Nearly all parts for the INFERNO MP9 are compatible so the machine can even be transformed into the original MP9 version. Let this INFERNO MP9 TK13 T1 Readyset open a new world of exhilarating off-road excitement! Includes pre-cut printed body complete with coloring. High power KE21R engine equipped with easy to handle recoil starter. 2.4GHz R/C system installed allows easy frequency band control. Includes KT-201 with LCD screen for easy management of settings.